As your child moves towards their teen years, they will encounter new and different challenges. As they develop both physically, mentally and emotionally, they learn quicker than younger children, but still in a different manner from adults. For younger children aged between 4 and 7 years of age, we have Little Dragons classes, while our Adult classes are suitable for anyone aged 13 and above. Our Junior classes are tailored for children between 8 and 12 years of age, with a fully structured curriculum from beginners through to intermediates and advanced. As your child progresses through our grading structure, their concentration and focus will improve, hence allowing for longer lessons for intermediate and advanced students that involves partner and weapon work, all taught in a controlled setting under the watchful eye of our instructors. 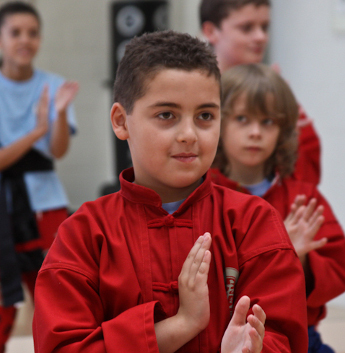 At Kung Fu Schools, we aim to guide every one of our students towards their Junior Black Belt and beyond! After all, a black belt is only a white belt that has never given up! Since our son Rishie joined the Kung Fu Schools, his self-confidence has increased very much. He is an academically sound child but did not have the courage and confidence to stand up in front of a big crowd and deliver himself. But now he can! A classic example of this: he did the Kung Fu demo in front of crowds at Greenvale Primary School. Rishie has always been a quiet, well-behaved child. Because of his quietness and shyness, he found it difficult to stand up for himself. Over his time at Kung Fu Schools, his self-belief and confidence in himself has boosted up gradually. He also learnt a lot in many ways, like how to defend himself from bullies. Also he is much more mature now. Rishie did his 11+ mock test last week a year earlier than he should. He also did a solo presentation in front of his classmates and their parents on Tuesday 28th June at his school assembly. All this shows how much self-confidence he has gained over the time since he began his Kung Fu. We parents would like to take this opportunity to say a VERY BIG THANK YOU to all the instructors and to Sifu Alan at the Kung Fu Schools (Croydon). Rishie wants to join the Leadership team now and that shows how much he is enjoying it at Kung Fu Schools. Our close links with the Confucius Institute of Traditional Chinese Medicine allows our Junior students to appear in various Kung Fu demonstrations and performances throughout the year. Some of our students have even appeared on Blue Peter with Jack Black to celebrate the release of Kung Fu Panda 2! As a parent, we can understand that while you want your child to develop into an academic and well-rounded individual, you also want them to have fun in the process. That is why we offer a no-obligation trial of 4 free lessons over two weeks, for your child to come and have a go!